Did you know communication improves each other’s self-care routines? Share these 3 critical things with your spouse. I once had a patient tell me she was working hard to lose weight for a special event, a class reunion, but her husband was making it harder for her to meet her goal. When they went out to eat he kept ordering a dessert for each of them to share on top of her order. She didn’t want to complain because they were on a date. But, it was causing her some irritation, resentment, and even bitter feelings towards her husband – she even started thinking he was purposely making it harder for her to meet her weight loss goal. She could not understand why he was doing this. Guess what. He had no idea his actions were upsetting to her. Her husband was just trying to make her happy – because he remembered that she loved to share a dessert when they were first dating. And he thought, wouldn’t it be more fun for her to share two? Of course, he had no idea how much stress his actions were causing her! But now, he’s stopped ordering desserts, because he knows what she wants. Crazy communication barriers like this one happen all of the time in marriage! But sharing these 3 critical things with your spouse improves the communciation in your marriage and also improves self-care routines. This one is pretty straight-forward. If your spouse doesn’t know what you are working towards, he/she won’t know how to help you get there. Share your over-arching goal, when you want to meet it, and how you are planning to reach your target. If it makes sense, you can even be specific about what you need from your spouse in order to meet your goal. Afterward, your spouse will know how to help and encourage you to reach your health and wellness goals. In the same way that your spouse can better help you after he/she knows your health and wellness goals, you are better equipped to help your spouse if you know their goals. Your spouse may have very different ideas and attitudes about setting goals for health and wellness. Still, you can help your spouse even if you both have very different goals. The point is to support and encourage your spouse in the way that works best for them. This one is a little more complicated. Focusing on your self-care can help you find your triggers. You know, those little signals (sometimes without our knowing) that provoke you to eat bad foods, or interfere with what you want to do or don’t want to do. Sometimes these cues are the same gestures that lead to negative emotions. Have you ever been in a conversation that was going along fine and then all of a sudden you or your spouse is offended by the way something was said? Many times the intent of what was being said had no connection to how it was heard. But a word, phrase, or tone somehow got attached to an emotional signal that generates a desire to respond, and many times out of context for the situation. Being aware of your own, and your spouse’s triggers are helpful. When you know how your spouse hears and wants to react to certain phrases or words, you have the answer to how to make things better (or worse) for your spouse. Using this information in an encouraging and supportive way can not only help you avoid saying or doing unhelpful things but lead you identify the helpful things to say or do. It can be embarrassing, but try to openly share these findings with your spouse. Be specific. You don’t have to share every little thought or reflection in your mind, but give them examples of words or phrases that bother you, and how they make you feel. And a step deeper, if you know it, share the reason why. All of these things will help with communication in your marriage! But, it can be hard to talk about triggers. I’ve found more people are comfortable talking about the difficult subject of what they like or want out of intimacy versus sharing their sensitive topics or triggers about their bodies. So, I’ve made a guide sheet, in the form of communication prompt to help you identify and share sensitive triggers. This might seem overly simple or even kind of silly, but I caution you to have an open mind. This form was built around real comments I’ve heard clients and people say! This handout has various question prompts to help start a conversation. Topics include what to bring home from the grocery store, date ideas for exercise or relaxation, what to order or not order at restaurants and I even have a list of wellness gifts you can discuss. Are you are working on your self-care and have a sugary or salty snack weakness? I have a prompt for that. If you are looking for date ideas to help you exercise, relax or connect back to nature I have some suggestions to get you started and a prompt for that conversation too! Want to set up some guidelines to use when at restaurants? I have a prompt for that. Maybe always skip dessert? Finally, ask each other if you are open to wellness gifts for birthdays and holidays. Then express to each other what your idea of a wellness gift looks like. For some it’s a manicure and for others it might be an MP3 player. 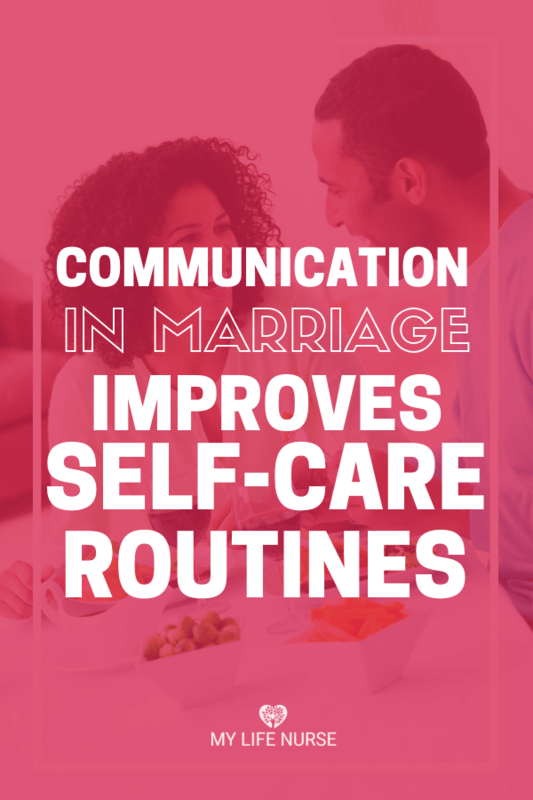 In closing, it takes some work but improving communication in marriage improves self-care routines for you both. Learning the other’s goals and triggers can show how to best encourage and support your spouse, which improves success in the self-care routine! You can learn where you need to be more sensitive to each other’s triggers or weaknesses. Your spouse better knows how to support your health & wellness goals. You know how to support and encourage your spouse with their health & wellness goals. Subscribe below to download your ‘Communication Improves Self-care Routines Guide Sheet from the My Life Nurse Library!